St Peter's Basilica - The church of the Vatican, St. Peter's Basilica is one of the largest and most famous churches in the world. It was built in honor of the Apostle Peter, who is regarded as the first Pope, and his remains are said to be buried beneath the altar (with some historical evidence to support that belief). Construction on the present building began in 1506 and continued until it was consecrated in 1626 by Pope Urban VIII (the same Pope who condemned Galileo for heresy). It is the second church to sit on the site. 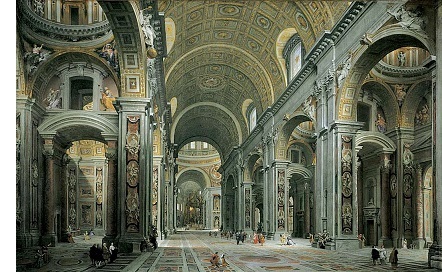 The original St. Peter's Basilica was built in the fourth century at the time of Constantine the Great and stood for 1200 years. But by the 15th century it was in serious disrepair and needed to be rebuilt or even replaced. Pope Nicholas V made the first plans, but serious work didn't begin until time of Pope Julius II, who decided on a whole new building. Over such a long period of time, several architects contributed to its design and construction. The first was Donato Bramante. But he died only eight years into the project, and plans changed dramatically from their original conception. Michelangelo took over at the height of its construction and designed the famous dome that sits atop the building (although it was not completed until after his death). The final designer was Gian Lorenzo Bernini who is responsible for St. Peter's Square, which is considered an architectural masterpiece. Before the original church was built, the site was the location of Nero's Circus, the place where the emperor executed the first Christians in 65 A.D.; and it's believed that Peter was one of those crucified there.